Food Costs > How Much Does Garlic Bread Cost? How Much Does Garlic Bread Cost? A perfect accompaniment for pasta is garlic bread — a piece of bread with butter and garlic mixture spread on it for that extra kick of flavor. On average, garlic bread is going to cost $2 to $6 for a pack of 6 to 12 pieces, either fresh or frozen. The price will depend on the brand and where it’s purchased at. For example, the Great Value garlic bread, made by Walmart, retails for about $2 for 16 ounces. This package has 16 slices in a bag and the recommended serving size is eight. Another grocery store chain — Publix — sells its own garlic bread for about $2. Michelle over at iheartpublix.com tested the Publix garlic bread and noted while it looked better, it will pretty similar in taste when compared to the Cole’s brand. Texas Toast, a popular garlic toast brand, can retail for about $3 to $4 for 16 ounces, or if you purchase at a wholesale club like Sam’s Club, the cost can be about $8 to $10 for a 32 count box. 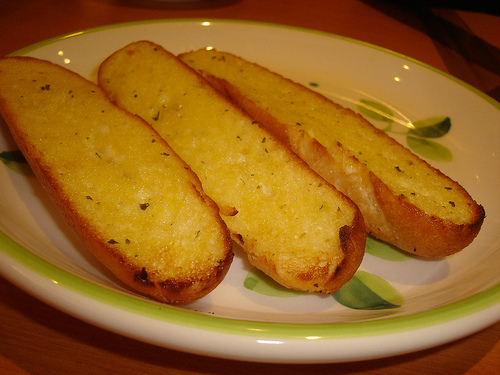 At most major pizza franchises, garlic bread is often available for $3 to $5. Popular garlic toast brands found in the store includes New York Brand, Cole’s, Pepperidge Farm and Texas Toast. Most retailers, such as Kroger, Walmart and Publix, also have their own version. Most frozen garlic bread will bake in eight to 10 minutes, and the average bag will contain about 16 smaller slices which are precut. Some may come in two long loaves that will be cut once baked. Depending on the brand, the average slice will have 206 calories, 10 grams of fat, 320mg of sodium 25 grams of carbohydrates and about 5 grams of protein. SFGate.com did a taste test between Pepperidge Farm, Safeway, Alexia and Mama Bella. Garlic bread is fairly easy to make. For less than the price of frozen pack garlic bread, you can gather all of the ingredients necessary to make some at home. For example, consider following a simple recipe such as spreading butter on some bread and throwing a pinch of cheese and garlic powder on top. Bake it for 10 minutes at 350 and viola — you have homemade garlic bread. Consider looking for coupons for major brands. Many of these brands will commonly offer coupons via their Facebook page and even in the Sunday paper. Oftentimes, the store brand garlic bread will have similar ingredients to the name brand. Consider sampling this brand as it could be $1 to $2 less.